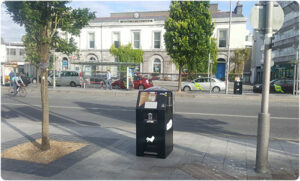 Galway City Council have installed ten SolarStreetBin™ litter bins from PEL Waste Reduction Equipment in Eyre Square, along Shop Street and on the Salthill Promenade. The IoT SolarStreetBin™ litter bin installations form part of a project investigating the potential of IoT (Internet-of-Things) technologies to impact the efficiency of litter collections in the city. The PEL Waste Reduction Equipment SolarStreetBin™ is a solar powered IoT litter bin manufactured by PEL Waste Reduction Equipment based in Co. Mayo. The bin is designed to hold up to x10 the quantity of litter compared to a standard 120 Litre or 240 Litre wheelie bin. The IoT SolarStreetBin™ litter bin achieves the additional capacity by means of an internal compactor built into the bin which is powered by solar energy. The bin features an ultrasonic bin-fill sensor which transmits litter level information to a central data management dashboard managed by the BriteBin™ software.The BriteBin™ software identifies litter levels within the individual bins and will email or send an SMS alert to the Galway City Council litter collections team when a bin is full and needs to be collected. The information provided by the BriteBin™ software along with the alerts system will allow the litter collections team to focus the collection resources i.e. personnel and equipment on the bins requiring service rather than dispatching the refuse trucks to collect bins irrespective of whether the bins are empty or not. 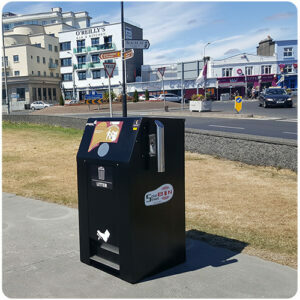 Galway City Council has installed the PEL120SSB – 120 Litre capacity IoT SolarStreetBin™ litter bin in the city centre locations whilst the larger PEL240SSB 240 Litre capacity SolarStreetBin™ has been placed in the busy Wolfe Tone Bridge and Salthill Promenade areas. It’s expected that the increased capacity offered by SolarStreetBin™ bins will reduce collection visits and traffic in those areas and in turn, reduce the C02 emissions that would normally be associated with the refuse trucks. In proactively managing the bin collections Galway City Council will eliminate overflowing bins which should lead to an improvement in general street hygiene standards in and around the areas where the SolarStreetBin™ bins are located. Users of the bins be pleased to see that the IoT SolarStreetBin™ litter bin is operated by a foot pedal which eliminates any hand hygiene concerns when a user has to touch the bin when depositing litter in it. The Galway City Council installations follow-on from the three SolarStreetBin™ bins which were installed in Galway Harbour last September to very favorable feedback – Click Port of Galway reduce litter collection costs with PEL Waste Reduction Equipment Solar IoT Street Bins to read the story. PEL Waste Reduction Equipment based in Balla, Co. Mayo is a leading manufacturer of bottle crushers, bin compactors, vertical balers and IoT litter bins serves a global customer base via offices in Ireland, the UK and a network of international distributors. The SolarStreetBinTM is the latest addition to the product range and adds to PEL’s recognition as leading innovator in the waste reduction market.